An acquaintance gave me a recipe from The Bulletproof Diet for a chocolate truffle pudding. I wanted to try to make it for Christmas, but didn’t have all the ingredients and couldn’t have the butter that it called for. So, in Rosemary fashion, I gave it a few tweaks (read: make it completely unrecognizable from the original recipe), and what turned out was perfect! I am a huge, huge fan of peppermint chocolate. I used to be obsessed with those Andes Mints back in the day (helloooo, sugar addiction!) and this reminded me of that. I brought it to our family Christmas dinner and even the non-Paleo among us scarfed it down. I only managed to get one picture when there were two bites left in the jar… hence the less-than-ideal photo. Next time, I will take a better photo! I think this would be super cute served in martini glasses with a sprig of fresh mint as garnish. The original recipe called for chocolate powder, which apparently contains cocoa butter. I didn’t have chocolate powder, so I just used cocoa powder plus what was left of my cocoa butter. If you don’t have the cocoa butter, you can substitute another tablespoon of coconut butter. It just lends a little extra chocolatey flavor. I’m sure melted unsweetened chocolate would work as well. 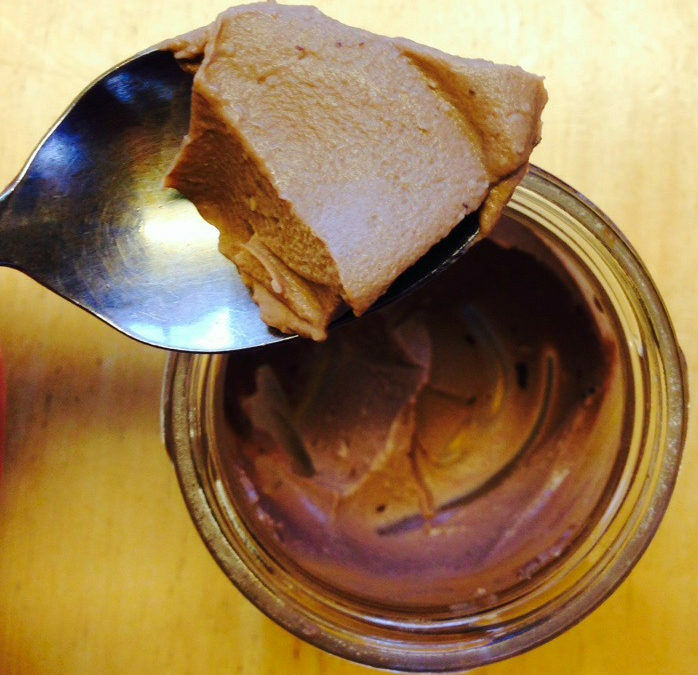 A dairy free peppermint chocolate pudding, excellent served around the holidays! Bring coconut milk and gelatin to boil, simmer until gelatin is dissolved. Add cocoa butter, coconut butter, coconut oil, and stir until melted in. Add the remaining ingredients and use an immersion blender to thoroughly mix everything together. Pour into small glass cups or small ramekins and put in refrigerator for at least three hours to set.